Pet Rescue Saga for Android is a game from the creators of Candy Crush Saga, King. We should probably mention now, at the beginning, that it is a block-matching game and it is free. 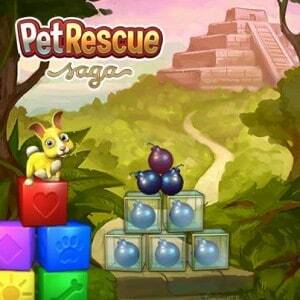 Pet Rescue Saga, unlike Candy Crush Saga is not about swapping. First of all, there will be a totally different goal in this game, rescuing pets from the so-called snatchers. The different levels’ objectives will vary accordingly. At times the goal will be to clear a minimum percentage of all blocks on the table, other times you will have to earn a minimum score and sometimes you will have a minimum number of moves in which you will have to fulfill any other objective granted to you. So, as you can probably tell already, Pet Rescue Saga is quite an entertaining game that can offer a pretty decent experience to any user. It can probably keep most of you interested for some time. But let’s see what this game is all about. 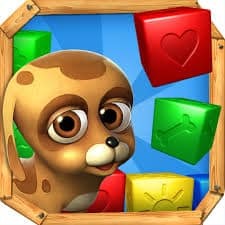 Pet Rescue Saga is about block matching. At the beginning of each game you will be presented with a board with differently colored blocks. 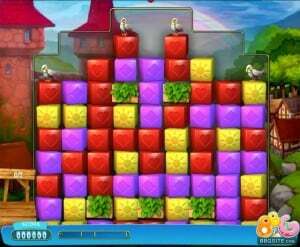 This game is about eliminating blocks but you will not be able to move them around. Instead you will have to tap on groups of 2 or more of them in order to make the disappear. As the score is of high interest, it is usually recommended to tap on group larger than two as that will give you a boost. Taps should be ordered in such a manner in which it will allow you to form large groups of blocks that can be eliminated. Levels altogether are very interesting and various. From each level to the other there will be a difference. Some of them, as previously mentioned, will require you to eliminate at least 80% of all blocks, others will require a certain score and some will give you a specific number of moves within which you will have to fulfill the objective given to you then. If at the end you will have some moves left, then you earn extra points. There are five lives available to you in Pet Rescue Saga. If you do not fulfill the main objective then you will lose a life. If you lose all of your five lives then you will have to either wait 30 minutes for them to refill or spend 99 cents to buy a full set if you’re a tad impatient. 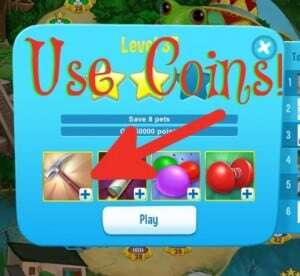 In order to help you more easily get through the game, the creators have added boosters to help your progress. They come in different forms obviously. So let’s take a quick look at the different boosters you will find in Pet Rescue Saga. Block Buster Booster is a hammer or a pickax that helps you clear a single block from the board. You get three of them at the beginning for free and it is recommended that you use them in the later levels when things get more complicated. They can also be bought for 3000 coins or for currency. Column Blast Boosters will help you clear an entire column and thus help you with saving the last remaining pets usually. They are very often granted to you during your play and it is best to save them as with all other boosters. A batch of 3 of them can be purchased for currency. The Line Blaster Booster will aid you just like the column blaster but will instead clear up entire lines, helping you with positioning of blocks and clearing last remaining pets. They can be purchased in batches of 3 for currency also. Color Pop Boosters appear sometimes in levels and they look like balloons. They will clear all the blocks of the same color as the balloon but will not give you as many points as clearing the normal way. So if you need points watch out because they also may create stranded blocks sometimes. You can buy 3 of them for money. The Mesh Masher Booster will remove cages and will help you in levels with lots of caged boxes and few moves. You receive three of them from the start with the possibility of buying more later with currency. The Key Booster will help you remove locked stone blocks. When you activate it the blocks will disappear. They can also be purchased. Caged Boxes are an impairment. Cages can be removed by popping boxes next to them or with the Mesh Masher. Planks will make it impossible for boxes to fall down and instead will hamper your progress. It is very important to think of how animals or blocks will act once they fall on these immovable objects. Bombs and Bombs in Glass Cases are an obstacle as well. Normal bombs are easy to remove. You just need to click on them. But the caged ones have to fall down or touch a planks. They can become quite annoying if they are very high up and prevent boxes from falling. Locked Stone Boxes will slow you down. Every time they are present you will get the key, the only booster capable of dealing with them. 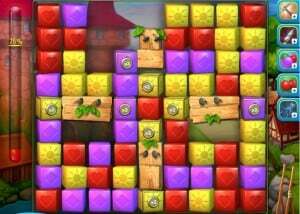 The keys are not necessary in order to finish the level, though. So this is all about Pet Rescue Saga for now. If you like this then you should probably get the game. It’s free! And tell us if you enjoyed it or not.